With the second week on its way and regular congress proceedings starting back up, we take some time to talk to Sascha Germer. He’s 31 years old from Berlin, Germany, and majored in Japanese Studies. He uses a wheelchair to get around and will soon start working at a centre for the severely handicapped. He will engage in peer counceling where disabled people help other disabled people. Fabian Bambusch (egc2017.eu): Why do you love Go? Sascha Germer: Like with many people, I started playing after re-watching Hikaru no Go for the second time. Unlike European Chess – which I tried before – you can play more freely and without so many restrictions. Also your goal isn’t necessarily to crush the other player. Especially though, Go is more interesting to me because board positions are more static, but not in a bad way. You have more time to look at the stones and predict developments. FB: When did you start playing Go? SG: Maybe three to four years ago? Unfortunately I don’t get a lot of practice since I mostly play at events. In my free time I play online… a few moves in my correspondence games every day. FB: [chuckling] Sorry for laughing, but I feel the exact same way. I used to play a lot more but these days with my job and other commitments, it gets harder and harder to maintain discipline and practice Go. SG: Yes, yes and I don’t really feel I’m improving too much like this. I should go to the Go Clubs more often, back home in Berlin. FB: How do you like the congress so far? SG: Now that all the kinks are worked out, from my point of view, I like it a lot here. At first I was supposed to play in the Event Hall. But because it is a lot harder for me to reach, I was assigned a board in the Sidekicks Hall instead. This kind of thing happens everywhere you go, but it’s easy enough to manage. 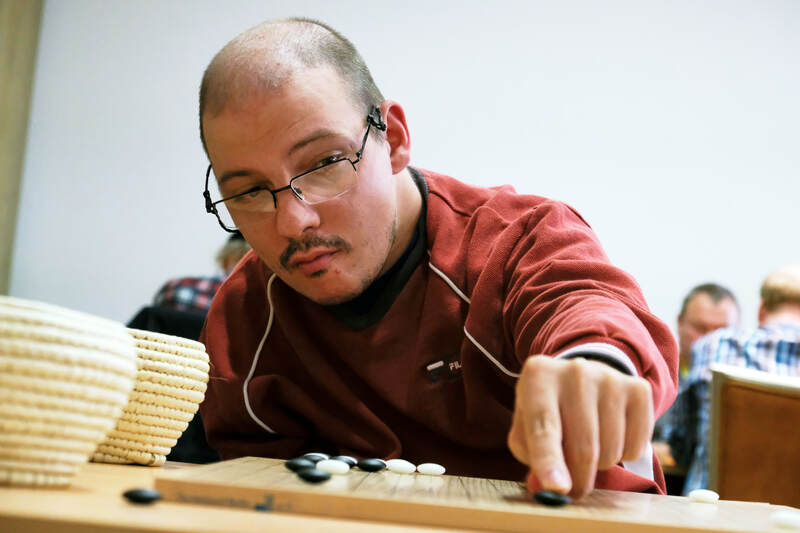 FB: Speaking of which… how was your experience with accessibility at Go events so far? SG: When I went to Osaka Go Camp in 2015 and 2016, I couldn’t reach everything easily when out with my wheelchair. But we knew about this in advance, so at least we could prepare and carry the wheelchair down the steps only when absolutely necessary. Hotel rooms were much smaller than you’re used to in Europe but this can actually be an advantage: rooms built for shorter people have lower ledges, making it easier for me to reach for things. Bathrooms especially are much nicer in Japan. The handicapped toilets in Oberhof are too high for me! FB: And what about European tournaments? SG: Well, admittedly I haven’t gotten around to many European events yet. This is my first European Congress, after all. And I only really heard of the EGC in Japan since the Japanese Go organisations are modelling their own congress after Europe. I’d also like to go to Pisa next year, but it’s still too early to plan. Two weeks in a hotel aren’t exactly cheap! FB: Have you made a lot of friends playing Go? SG: Most of my Go friends, or acquaintances rather, I’ve made in Osaka. I’ve met a lot of Europeans there, too, but Berliners (and people close to Berlin) are of course in the minority. Therefore, interactions are unfortunately limited to keeping in touch on Facebook. I don’t terribly mind this, but sometimes you wish for a best friend you could meet regularly who also shares your favourite hobby. But you can’t force something like this which might be a once in a lifetime friendship. FB: But there are multiple Go Clubs in Berlin, aren’t there? SG: That’s true, I should really visit the University Club more often. FB: Do you know other Go players with disabilities? SG: No I don’t, honestly. The other gentleman in a wheelchair at the congress isn’t playing. It’s his assistant who’s a Go player. My exact opposite situation. But even though I haven’t met any handicapped people interested in Go, I’m really impressed with how active and diverse the Go community has become!